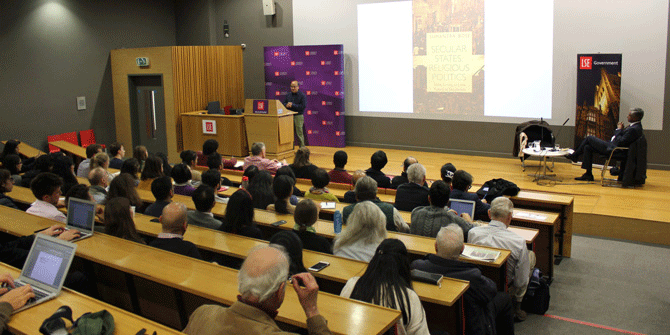 In a Public Lecture at LSE’s Sheikh Zayed Theatre on 23 October 2018, Professor Sumantra Bose presented an overview of his latest book, “Secular States, Religious Politics: India, Turkey, and the Future of Secularism.” He argued that comparing Turkey and India is very fruitful for understanding the origins, evolution and current problems of the secular state in the non-Western world. According to Professor Bose, Turkey has turned into a de facto anti-secular state in the early 21st century, while in India the majoritarian Hindu nationalist movement, politically represented by the Bharatiya Janata Party (BJP), has emerged as the country’s leading political force. After laying out the differences and similarities between these two non-Western countries, Professor Bose asked whether India faces the same anti-secular fate as Turkey. Professor Bose’s answer to this question was derived from arguments pulling in both directions. The historical and contemporary contexts of India and Turkey have similarities, but also significant differences. 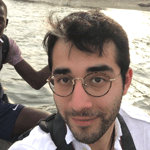 Although this complex approach might leave the general audience unsatisfied, it is still quite useful to illuminate the religious-nationalist, majoritarian and right-wing trend across the world today. What happened to Turkey? A country whose regime once dared to change its alphabet overnight, prohibited its citizens from wearing eastern-style hats, and borrowed its civil code laws from Switzerland, has evolved into an anti-secular state based on a Hanafi-Sunni conception of Turkish national identity in the early 21st century. Will the same thing happen in India? Will the Hindu nationalist BJP come to dominate India’s politics to the same extent Recep Tayyip Erdogan’s Justice and Development Party (AKP) has achieved in Turkey? Officially, Turkey is 99% Muslim and India is 80% Hindu. Turkey has a 20% ethnic Kurdish population and around 15% of the population is Alevite (a heterodox sect of Islam). Erdogan has successfully marginalised these minorities. However, India’s scale of diversity is far greater. India is a vast mosaic composed of numerous ethnic, linguistic, religious and caste communities. In fact, Professor Bose suggested viewing India as analogous to the entire European Union in the scale of its diversity. So replicating Erdogan’s majoritarian formula in India is an uphill task for the Hindu nationalists led by Narendra Modi, he said. A key similarity between the Indian and Turkish secular states is their indifference to the wall of separation doctrine (between religion and state). In contrast to the Western prototype of secular state, India and Turkey were both set up as states with vast powers of supervision, regulation and control over matters to do with religious faith. In Turkey, this was primarily exercised through the Diyanet, the Directorate-General of Religious Affairs. From 1960 onwards, the Turkish military repeatedly perpetrated coups, direct and indirect, with the avowed purpose of maintaining stability but also to preserve the secular state. The Constitutional Court also acted as a watchdog of secularism. The Indian constitution (1950) guarantees freedom of religious belief, practice and propagation to all, but on the condition that it does not infringe on public order, morality and health, which are obviously vague concepts subject to interpretation by those at the helm of the secular state. In fact, Professor Bose pointed out several instances over time in which the ostensibly secular state’s interventions have been biased against religious minorities in India, particularly Muslims, who are 15% of India’s people today. That the Congress party, supposed to embody the founding secular principles of the Indian Republic, openly used Hindu majoritarian electoral strategies in the 1980s shows how the secular state was undermined by those in power. Professor Bose made this point to argue that it was those in power rather than the general public who undermined Indian secularism. This point of his is contestable, as one can argue that there was a sociological reason and pragmatic rationale for the compromises made. The Congress elites in power resorted to Hindu majoritarianism to avoid the elitism problem and satisfy the Hindu nationalist sentiments deeply embedded in the masses. In the case of Turkey, Professor Bose talked about the repeated military interventions to demonstrate how periods of repression eventually strengthened the religious conservatives’ claim to martyrdom and created a cult around their leaders, notably Erdogan since the late 1990s. It is true that such interventions ultimately undermined Turkish secularism. However, I think there was, and still is, a massive amount of public support for the anti-secularist version of Turkish nationalism, which had been held in contempt and ignored by the state’s Kemalist ideology until the early 2000s, when it was revived and articulated by the AKP. That the Turkish military, ostensibly secularist, promoted a “Turkish-Islamic Synthesis” as the de facto state ideology throughout the 1980s perhaps demonstrates an attempt at a compromise with mass sentiments prevalent in Turkey. But that still begs the question of whether Hindu nationalism will emerge hegemonic in India in the same way as the AKP in Turkey. Amit Shah, Modi’s closest aide and the BJP’s national president since 2014, has repeatedly expressed such an ambition. In the final part of his lecture, Professor Bose gave three arguments as to why the scale of Shah’s ambition is unwarranted. In doing so, he highlighted three key differences between India and Turkey. First, Professor Bose rightly underlined the “Occidentalist” aspect of the Kemalist mentality, preoccupied with crudely imitating the West and especially Europe. It turned into a fixation hostile to Turkish history, roots and culture. Thus Turkish state-secularism lacked an indigenous basis, content and argument, unlike India’s version of secularism, which always stressed its cultural authenticity, and historical continuity with India’s tradition of co-existence between faiths based on mutual respect. Professor Bose quoted Gandhi’s famous answer in the early 1930s when pressed on his views on Western civilisation: “It would be a good idea”. The crudely imitative nature of Kemalist secularism explains the authoritarian character of the Turkish Republic, where secularism had to be imposed through military and judicial intervention throughout its history. By comparison, India’s secular state, with all its flaws and anomalies, developed in a relatively democratic, non-coercive environment, which gave Indian secularism a substantial degree of popular legitimacy, and that endures even in the current era of Hindu nationalist ascendancy. Finally, the structure of state power is decentralised in India, which means that unlike in the highly centralised Turkish Republic, many political players, especially powerful “regional” parties based in one of the 29 states that comprise the Indian Union, have a say in India’s future political trajectory. Most of these parties are opposed to the Hindu nationalist vision of India. Overall, the lecture, and the subsequent lively Q&A session, were stimulating and made me curious about Professor Sumantra Bose’s book: “Secular States, Religious Politics: India, Turkey, and the Future of Secularism”. I end this blog post with one of Professor Bose’s more controversial points. He stated that India’s people are attitudinally much more inclined to democracy than Turkey’s people. I make this point in the hope of encouraging a wider audience to closely read and study his latest book.